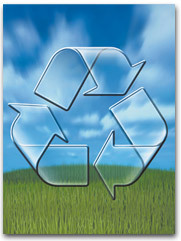 Recycling is a vital part of our efforts to preserve the environment. We are encouraged to recycle cans, plastic, glass and just about everything else. After all, it's the right thing to do. Yet, when it comes to recycling water, there seems to be hesitation, or what some people call the "yuck factor." Apparently, the idea of taking wastewater and cleaning it for reuse can bring out the skeptic in even the most informed members of our community. So, why are some people unwilling to accept and believe in a process that has been happening naturally since the beginning of time? Lack of information and abundance of misconceptions have been the biggest obstacles in our efforts to truly understand the safety and quality of recycled water. After visiting this website, we hope that you will see the value and importance of recycling water. After all, there really is no such thing as "new water." For billions of years, earth has been cleaning and reusing water over and over again. It's called the hydrologic cycle, or the water cycle. In school, we learned how the rain (precipitation) falls to the earth, and then evaporates into the sky when the sun comes out (evaporation), forming clouds (condensation). When the clouds become heavy with moisture, it rains again, and the cycle repeats itself. When the rain percolates through the layers of soil to natural underground pockets called aquifers, the water is filtered naturally through layers of sand and becomes clean enough to drink. Through this natural process, earth continues to recycle, or clean, the water. Today, with modern technological advancements and extensive research, we have learned how to mimic this natural process and can do it at a much faster rate. And by using the most advanced water treatments to purify the water, including microfiltration and reverse osmosis, our recycled water exceeds all state and federal drinking water standards. During the microfiltration process, water is pressurized in pipes containing straw-like fibers with pores that are 5,000 times smaller than a pinhole. During reverse osmosis, water is pressurized at about 800 pounds per square inch (which is equivalent to 800 pounds pressing on every square inch of your body,) through tightly wound layers of membranes with pores that are 5 million times smaller than a pinhole! To date, reverse osmosis is the most advanced filtration process, surpassing even the hydrologic cycle. The first phase, or primary treatment, begins when the wastewater reaches the sewage treatment plant. During this phase, solids are removed from the water. The water then undergoes secondary treatment where tiny dirt-loving microorganisms are added. These microorganisms, found naturally in rivers and other bodies of water, eat particles that are too small to see or too light to settle. Once these organisms get full and heavy, they fall to the bottom leaving cleaner water to rise to the surface. Then, during tertiary treatment, the water goes through a filtration process where the water moves through layers of fine anthracite coal, sand and gravel which trap microscopic particles. The man-made filtration process simulates natural underground seepage occurring in aquifers. In addition, disinfectants such as chlorine are added to kill germs. Tertiary water is used mostly for landscape irrigation and various industrial and commercial uses. Water recycling is a proven natural process that has been occurring for billions of years, and today, we have been able to replicate this cycle and even improve on it to produce safe and high quality water. About 75 percent of Earth is covered by water. It sounds like a lot, but only 1 percent of that is freshwater available for serving the water needs of more than 6.6 billion people in the world today. Because of drought and pollution, that 1 percent is slowly dwindling. To make matters worse, the world population continues to grow, thus increasing the demand for water. Now, to bring it closer to home, in Southern California, more than 66 percent of our water supply is imported from outside the region. During the next 15 years, California must reduce its imported water supply by nearly 1 million acre-feet (one acre-foot equals 326,000 gallons), but our population continues to rise. In a nutshell, as the available water supply is decreasing, the demand for water is increasing. You can see the problem. To ensure that we have enough water to meet our present and future needs, we need to conserve water and expand the use of recycled water. In essence, by expanding the use of recycled water, we are actually helping to conserve our drinking water supplies. There's also an added big bonus. Recycled water is good for the environment. Without recycling, secondary treated sewage water would be discharged directly into our oceans - affecting the marine life. By recycling, less water is discharged, improving the environmental condition of our coastal waters.